Ok, so this term “farmhouse chic” isn’t something I coined, I take zero credit for it. It describes the trend toward simplicity and nostalgia sweeping home decor. And honestly? Having grown up on an actual farm (with cows and everything), I do confess to occasionally finding this whole farmhouse deal pretty hilarious at times. Because let’s be honest, farm life is more about manure than anything else. And there is nothing pretty about manure. No one wants that in their house! But now, chicken wire doesn’t mean chores to me, it means cute not kitschy. (Well, my mom who still lives on the farm doesn’t really get into the chicken wire thing. She thinks its weird. To her? This is fencing. For chickens. It belongs in your house as much as manure belongs in your house.) But for some reason I mustn’t be too scarred by that rooster because obviously, I like this chicken wire dealio. So tip number one – if you want to create a farmhouse chic look – get your chicken wire on. Another farmhouse trend that I’ve seen all over Instagram and have started incorporating into my shop’s inventory is garlands. I know, I used to think garlands were synonymous with Christmas, too. But these strings of ripped up fabric are becoming incredibly popular. They add texture, interest and softness to your room in an atypical way that is normally accomplished with curtains, pillows, rugs and table runners. With a garland, you can compliment any color scheme and add softness to your room by stringing it on a cabinet, mirror, hutch or across a headboard. The possibilities are endless. I displayed this one on our hutch, Iris, in our parlor. When my best friend, Nicole, first saw the garlands at my shop she exclaimed, “Oh, this is so Little House on the Prairie!” — I thought that hit the nail on the head and may provide a reason behind why farm girls love garlands. They remind us of wearing dresses as little girls, playing house and dress up in our mom’s closets – they seem to carry the memory of something beautiful within them. A simpler time. Speaking of a simpler time, primitive vintage pieces are key for creating a farmhouse look. I added a few of these to my inventory just this week. 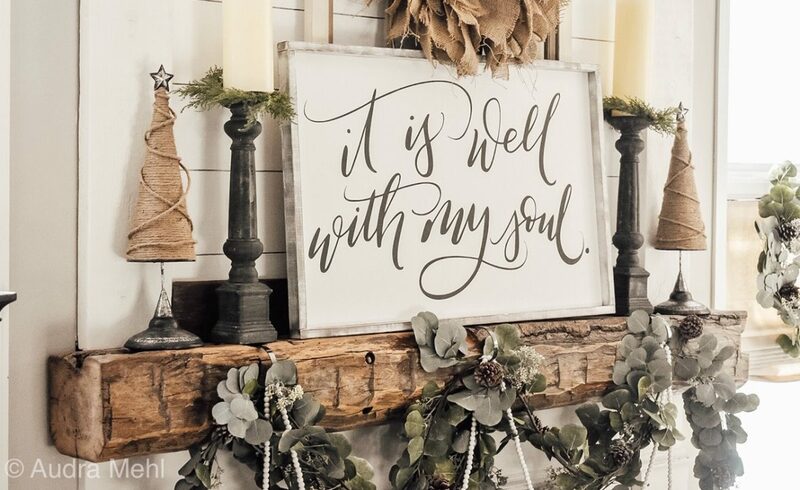 Primitive wooden items definitely give that texture that is so vital for a farmhouse theme. And don’t forget some weathered enamel to display atop your kitchen cabinets or farmhouse hutch! The old coffee pot in the vignette above has the perfect amount of history on its patina . . . I want to keep it so badly! But if I kept everything that wouldn’t be great for business, so she is on display and for sale at Grace 1972. Obviously, everyone is getting on the farmhouse train these days and HomeGoods and TJ Max are no exception. These stores carry some of the hottest pieces right now by artist, Rae Dunn. Unless you are living under a rock, Rae Dunn is probably the quintessential farmhouse chic must have item. If you are just now crawling out from under your urban rock, Google Rae Dunn. Look at all the Instagram accounts devoted to it. Rae Dunn has a cult following and people are crazy for it. (I am also one of the people who just love it, guilty.) It lasts on the shelves at retailers for all of two seconds before it is gone. Thankfully, we’ve found a way to find it and we carry it at Grace 1972. I’m having a blast photographing it for our shop! Every piece is absolutely exquisite. Mixing vintage pieces such as crocks and these rolling pins and butter churn with Rae Dunn pieces achieve the classic Farmhouse Chic look. One of the last strategies I’ll touch on for creating a farmhouse look is the use of . . . wait for it, CHALK PAINT! Changing the color of furniture is no longer the laborious task of sanding and stripping that it used to be. You can literally find chalk paint just about anywhere these days and it is good stuff! Two coats is all you need for a magical transformation. I have chalk painted my kitchen cabinets, fireplace facade and lots and lots of furniture. Last weekend I actually chalk painted a brand new piece, this Pier 1 half moon sofa table. In less than an hour this piece went from earthy green to a soft teal that complimented my home office. I just love it! I did some minor distressing with a 220 grit sandpaper on the edges to make this new piece appear more vintage. Instant farmhouse chic. Voila! Last but not least, I’ll include some shots of the table in our kitchen, for there is nothing more imperative to an actual farmhouse than the kitchen table. My parents constantly had a stream of friends over for coffee at ours when I was growing up. Before kitchens had islands, they had tables. And the table was the heart of the home. Everything happened at the table, not just meals. Family meetings were held, prayers were said, homework was done and coffee with friends, old and new, was enjoyed. So if you’re all about the farmhouse look, then make sure you give a lot of attention to creating your very own farmhouse table. I don’t normally photograph my table from this angle because our home came with mirrored doors on the pantry and that is certainly not congruent with a farmhouse look. My husband is planning to create barn doors for them this summer so I always photograph my kitchen carefully to avoid showing the mirrored doors. But what the heck – here they are in all their reflective glory. Yes, the built in hutch even has a mirrored back splash . . . like I’ve said before, subway tile goals! This table is actually 15 years old. It isn’t anything special at all. It is a mass produced piece that I picked up at Conlin’s Furniture years ago and it was starting to show its age. The top was a light veneer (and the chairs used to be sage green back when I was into that color, I painted them black a few years ago.) The veneer had marker stains on it from when my kiddos were little, numerous round water glass marks and it was just basically in very rough shape. The old girl had seen better days. Even though I loved the size and shape of it (easy to add extra chairs on the rounded corners when hosting extra company) it was looking like time to say goodbye. I even started drooling over some Magnolia Home farmhouse tables and had an entire set picked out to replace her. My husband was the one who said he thought she could be salvaged. We made a bargain that he would refinish and stain the top, even distress it a bit to appear more rustic. If I hated it, we would go table shopping. But if I loved it? We would keep it. We lived without a table for two weeks while Matthew worked on her. This was smack dab in the middle of the time frame where we were moving his business and opening mine so life could not have been busier. But he fit in 15 minutes here and 15 minutes there. And when she was done? Well – obviously, I just love her to death. And so there you have it. If you’re a little stumped on how to inflict a little farmhouse feel into your home start with the basics. You’ll be amazed at what a little chicken wire, torn fabric, Rae Dunn and a few key primitive pieces on your farmhouse table will do.